The current Incorporated Society rules of PAGANZ Inc can be downloaded below. In addition to the rules, the following regulations are in place. In keeping with Society Rules Section 3.0 Purposes of the Society these regulations indicate how PAGANZ Inc shall organise the PAGANZ Annual Meeting by formation of a sub-committee (the Scientific Organising Committee, SOC) and the relationship between the Committee and this sub-committee. 1.1 The Society shall have a Local Organising Committee (PAGANZ LOC) to organize the PAGANZ Annual Meeting. 1.2 The PAGANZ Scientific Programme shall be decided by the PAGANZ Inc Committee. The PAGANZ LOC shall be responsible for implementing aspects of the PAGANZ Annual Meeting including, but not limited to, the Population Analysis Work Shops (PAWS), the PAGANZ Scientific Programme and the PAGANZ Social Event. 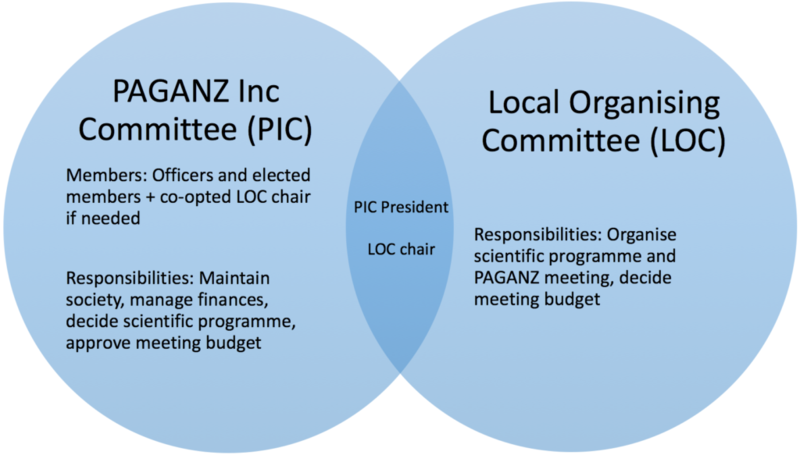 1.3 The PAGANZ LOC shall be composed of at least two members of the PAGANZ Inc Committee. The PAGANZ LOC shall determine the remaining composition and regulations of the PAGANZ LOC to the extent they are consistent with the Rules and Regulations of the Society. 1.4 The Society agrees to underwrite acceptable losses of the PAGANZ Annual Meeting in return for receiving any profits from the PAGANZ Annual Meeting. 1.5 The Society Committee shall approve acceptable losses in advance of each PAGANZ Annual Meeting based on a budget for the PAGANZ Annual Meeting prepared by PAGANZ LOC no later than 60 days before the start of the PAGANZ Annual Meeting. Co-opting of an additional member into the PIC may be performed under 8.1(e). Such a co-opted member would have full PIC voting rights for up to 12 months prior to the upcoming conference. The committee structure was agreed at the PAGANZ Inc AGM held 8th of February 2017. The term of PIC Officers and Members shall be 2 years, after which nominations (and election if necessary) will be due at the next AGM. This does not constitute a term limit (i.e. Officers and Members may continue in their role). PIC term was agreed at the PAGANZ Inc AGM held 8th of February 2019.